Nothing more than death tests the value of words. Yet you make the words, speak them and write them, for theyre all you have left to stand in sted of a person who is no more. Elizabeth Catherine Sherwoods sparkling soul fled with breathtaking speed before work on the morning of January 28. That Friday might have been what it seemed, a day like any other, but for one difference. Fearing the county plow would block her driveway, Betty Sherwood had, on Thursday, left her car across Benfield Road from her home in the Severna Park community of Kensington. To reach her car on Friday morning, Betty had to cross the busy three-lane road. Apparently dazzled by brilliant sunlight reflected off snow and windshields, she stepped into the path of an oncoming van. The vans driver told police she was also sun-blinded. Bettys small body tossed and smashed, her great heart stopped. Ive spoken to County Executive Janet Owens and Im mounting a campaign to get a blinking light and crosswalk for this intersection, where dozens and dozens of westerly traveling cars can be backed up at that time of the morning, said John Jack Sherwood, Bettys husband of 44 years. Sherwood, a longtime reporter, has since 1998 been Annapolis bureau chief for the national boating newspaper Soundings. Word of Bettys death sped through Chesapeake Country the way an injection of cortisone burns along the branches of a living nerve. The pain traced the map of her spirit, searing person after person who had known and loved her. Each attempted to catch hold of the Betty we had known, aware, even as we spoke, that making words was like trying to catch the wind. Betty she was always smiling, said Vera Freeman of Veras White Sands. A great friend of both Sherwoods, Vera was a subject of Johns book, Marylands Vanishing Lives, published in 1994 by Johns Hopkins University Press. Everything was such great fun with her, and she loved to go, said Vera, reflecting on twilight parties with the sun dipping into the Patuxent River and shared winter travels to warmer climates. Then, hitting the wall beyond which words cannot go, Vera gave it up: "Betty was your friend and that was it, said Vera. In the Maryland House of Delegates, the searing news traced other memories. Betty had worked in the House for 10 years, full time during the session and part time during the rest of the year. The morning of her death, Del. Joseph J. Minnick, chairman of the Baltimore delegation, announced the sad news in the House of Delegates chamber, eulogizing the bubbly, cheerful woman who loved  and was loved by  all who knew her. 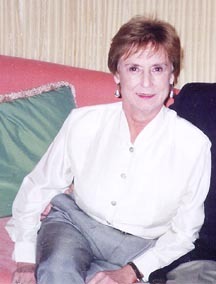 Six of those years, Betty had been administrative secretary to Baltimore County Del. Jake Mohorovic. Betty and I never managed the House of Delegates lunch we kept rescheduling, but we met a couple times a year at Veras. Thats where I saw her last, on the day after Christmas. As usual, I sought her out because her energy was irresistible. She radiated energy like a Fourth of July sparkler. Her values were Fourth-of-July American, too. Betty was an old-fashioned Democrat who grew up in Irish Catholic, working-class Baltimore and believed in a fair deal for the little people. Shed speak her mind with sparky independence, no matter what the company or popular ism. When Betty and I put our heads together, conversation tended to our sons, of whom she had three  Eric, Mark and Scott  to my two. One of mine was married, to none of hers  though all had reached their 30s. So the best news of her year had been that all three brought girlfriends home for Christmas. Theyd had Christmas Eve together, then spent the night. But, Betty was quick to tell me, not together. Im too old-fashioned for that, she laughed. Laughing with outspoken joy: Thats the Betty Sherwood who sparkles in my heart.